“But why chemo,” you may ask? Aren’t you cancer free? Aren’t you cured? The problem with pancreatic cancer is there are no really good tests to find it. We know from my Whipple surgery all the identifiable cancer is gone. Blood markers often seen in those with pancreatic cancer are in the safe zone. I remember this routine. At the doctor’s office at 10:30. A quick exam then short drive later, chemo. I was on my way home around 1:00. 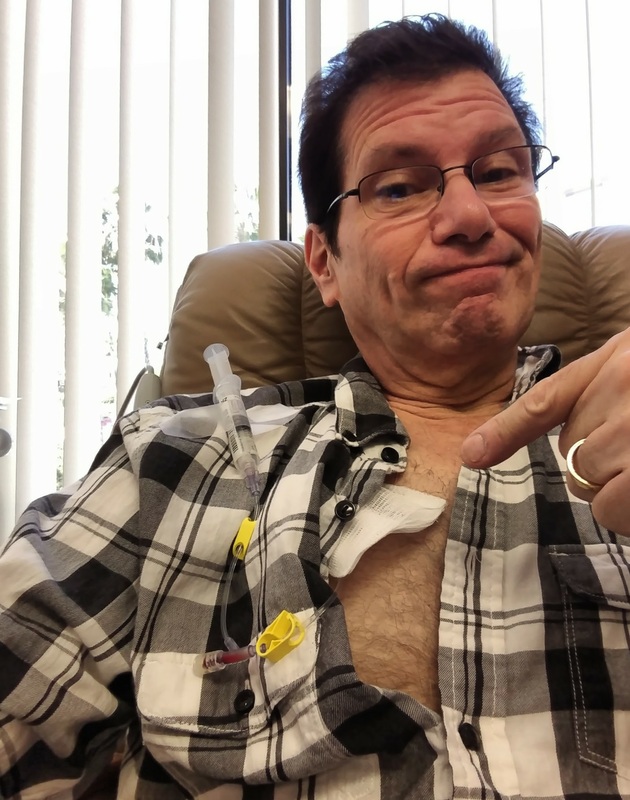 “But why chemo,” you may ask? Aren’t you cancer free? Aren’t you cured? The problem with pancreatic cancer is there are no really good tests to find it. We know from my Whipple surgery all the identifiable cancer is gone. Blood markers often seen in those with pancreatic cancer are in the safe zone too. Are there microcells in the process of forming? Who knows? That’s why there’s chemo and radiation. We are taking no chances. It must be effective because Blue Shield has approved every step in the process. The problem with chemo is it’s an indiscriminate killer of cells. We’re zapping good along with bad. The assumption is the good will grow back. The whole process is slow-motion stressful. I’ve slept as much as twenty hours on Saturday after a Thursday infusion. Until Saturday the chemo had no physical effect at all. No part of my cancer treatment has been beyond my ability. It’s the cumulative effect of all the little pain, inconvenience and indignities that has begun to get to me. This is the last scheduled treatment, six chemo sessions in eight weeks. Enough already. You are an inspiration whether you realize it or not. You are one brave subject! I had chemo for 6 months. And they would have a hard time getting me to do it again! It knocked me for a loop those 6months. Then radiation for the next 6 months, that was not so bad. Just tired most of the time! That was a long time ago though and I still remember most of it. We all admire your fighting spirit, Geoffrey! Some people would just say “screw this” and let nature take its’ course. Not you. You are a fighter. After all, you are a New Yorker and they don’t quit! Good luck Geoff. You sure have been put through the wringer. We will pray that it was all worth it. You got this, Geoff, keep on keepin’ on! You will do it as depressing as it is. Your father is a very meaningful part of your life–your biggest cheerleader. You will always keep him happy as he has always kept you happy. And, your wife, and daughter–just look at them and you have to smile. And, of course, there’s always Doppler!! Smile, Geoff. Life is to short for frowns. This is what wears us down. The slow progression of treatment and the growing tiredness with the fight makes you want to quit. But don’t. As long as you are getting good results, it is worth the effort to get to stick around a while longer! Let me 100% clear — I am fully committed to my treatment. On the way in I told my doctors I wanted this treated aggressively. They listened. Geoff, Thats the way it should work, And you are alive and almost well. Good Luck from an old Connecticut fan. I’m happy to hear you’re doing well. It’s a hard thing to beat. My brotger-in-law lost his battle of esophageal cancer last week at age 65. He had been on here leaving messages of encouragement for you. Keep up the treatment and get past this terrible cancer.